di cui la prima dedicata tutta alle tradizioni locali. Lo spettacolo riproduce la serata del sabato sera che si organizzava nell’Aia a fine settimana lavorativa, mentre i balli e i canti riconducono alle esperienze quotidiane della civiltà contadina. 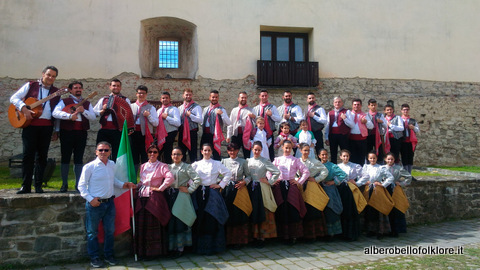 Nel corso di tutti questi anni, il Gruppo ha partecipato a numerosi Festival Nazionali ed Internazionali, dislocati in tutte le Regioni d’Italia e in svariati Paesi del Mondo, quali Stati Uniti, Libia, Spagna, Grecia, Olanda, Germania, Francia, Lussemburgo, Belgio, Svizzera, Austria, Slovacchia, Ex-Jugoslavia, Inghilterra. 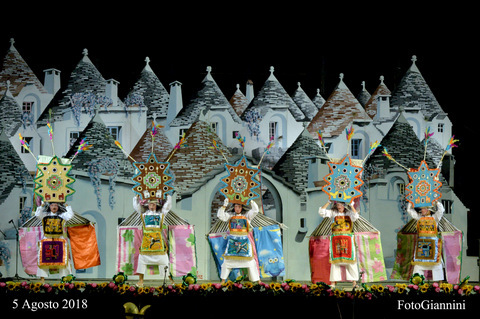 The folk group "Citta dei Trulli" from Alberobello continues the work of entertainer Isabella Sgobba who, in 1928 with a group of towns folk started to discover the forgotten traditions, costumes, dance and songs from Alberobello dating back to the late 1800's, conserving through the years the culture and the traditions of the place. 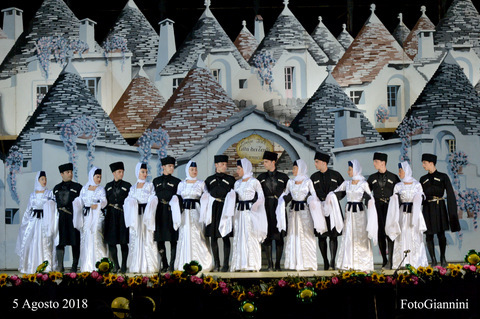 The COSTUMES with which the group exhibits are replicas of the same costumes worn by the Alberobello people in that era. 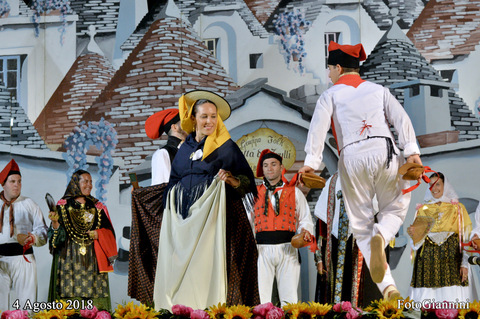 Where the women dress in typical work clothes the men wear the characteristic "Carrettiere" costume, recognised by the wide red sash worn around their waist. 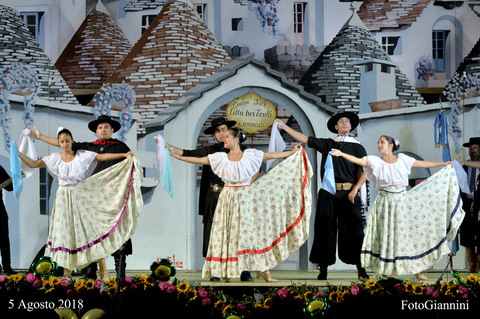 The SHOW reproduces the Saturday night when they would all congregate in the "Aia" (beating ground) to celebrate the end of the working week, whereas the dances and the songs tell the tale of daily life of the working farmers. 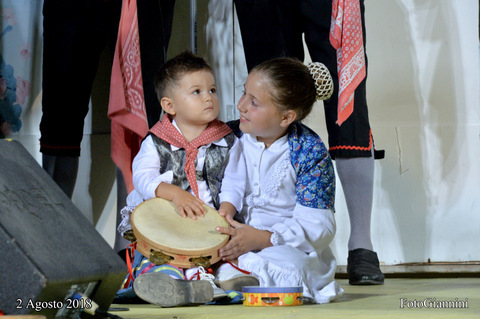 During all these years the group has participated in numerous national and international festivals, in many regions of Italy and various places around the world to name a few the United States, Libya, Spain, Holland, Germany, France, Luxemburg, Belgium, Switzerland, Austria, Slovakia, Ex-Yugoslavia and England. 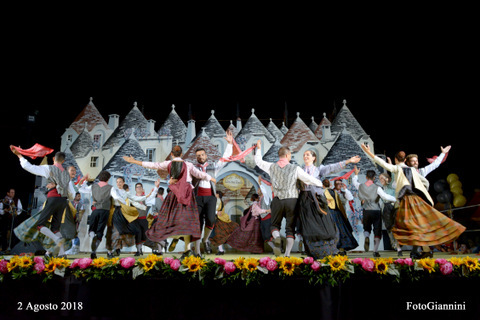 Currently the group is compiled of 30 dancers accompanied by organs, guitars, tambourines and all directed by the president Nino Agostino.